Colonel Count Marcellus Donald Alexander Ritter von Redlich (1893-1946) was a member of the Order of the Crown of Thorns. In the photograph, he wears the insignia of the Order, second from right in the group of full-size medals. von Redlich held several doctoral degrees and was a Professor of Diplomatic History and International Law at the US Foreign Service College. Born in Hungary, the only son and heir of Baron Harold I.S.R. von Redlich, he became resident in the United States, and was based in Chicago in his later years. He served in World War I with the United States Army and as Assistant Registrar and legal advisor of the US Draft Boards from 1917. He was additionally Privy Councillor of Justice to Prince William of Albania, legal adviser to King Nikolai of Montenegro, consul of Monaco and Latvia, and consul-general of Iran and Albania. He emerges as a prolific author on diplomatic and genealogical topics, and was editor of the International Courier. His books include “Pedigrees of some of the Emperor Charlemagne’s Descendants” (1941), “International law as a substitute for diplomacy” (1928), “The law of nations” (1937), “Mohammedan law”, “Persian language and literature”, “Justice for Hungary” (1935), “The last strong-hold of Old-world tradition” (1935) and “Resume of the movement for world peace” (1937). He was also a contributor to diplomatic and genealogical journals. In 1942, he was elected a Fellow of the American Society of Genealogists. He was also a member of the Society of Genealogists (London), the College Heraldique de France, the Royal Society of Literature, the Grotius Society, the International Law Association and the American Society of International Law. von Redlich was active in chivalric affairs. 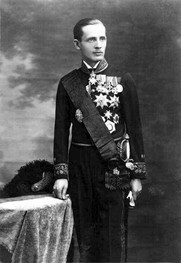 He was Grand Officer of the Order of Danilo I, Knight First Class of the Order of Ernest of Saxe-Coburg-Gotha, Grand Cross of the Order of the Holy Sepulchre, Grand Cross of the Albanian Order of the Black Eagle, Grand Cross of Justice of the Order of St Lazarus of Jerusalem, a knight of the Orders of the Lys and Saint Agatha and so on. He founded the Order of the Crown of Charlemagne on 1 January 1939. This body still exists today and both commemorates the life and achievements of the Emperor and seeks to gather together his descendants, to whom membership is restricted. von Redlich’s “Pedigrees” remains a standard and much-cited work on Charlemagne’s descent, and two more volumes were issued in due course under the editorship of other authors. Another interest was in Albania. 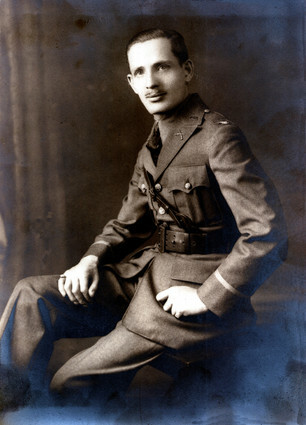 He addressed the position of the House of Wied and Albania’s history in books, and with Brigadier-General William Edward Horton and a group of young Albanians organised the Society of the American Friends of Albania with headquarters in Washington, DC. This was a club with the aims of fostering links between the two nations, supporting exiled Albanians and promoting information about Albania. 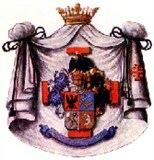 von Redlich received the title of Count de Policastro from King Nikolai of Montenegro and was granted arms as such in January 1932 under the aegis of Sir Nevile Wilkinson, Ulster King of Arms. A further grant was made by the same authority in 1935 recording his title of Baron. He was twice married, secondly to Frederica Adelaide Marie Jeter Doll, and had issue by both marriages.